« Déjà vu all over again? Conclusion: All politics is “identity politics”. The Economist and YouGov, a pollster, have surveyed thousands of Americans and built a statistical model to predict political party preferences. Think: generic ballot for Congressional elections. America’s founding fathers envisioned a republic in which free-thinking voters would carefully consider the proposals of office-seekers. Today, however, demography seems to govern voters’ choices. Specifically, Economist and YouGov identified a dozen demographic characteristics that highly predicted how people would vote in Congressional elections. 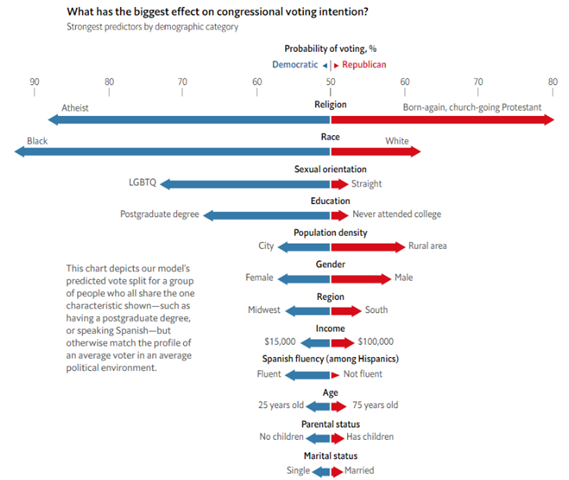 Of the 12 statically significant variables, religion is the most significant … with atheists likely to vote Democratic and born again Christians likely to vote Republican. Tech note: The length of the entire bar – blue plus red – indicates the level of significance. Race scored second in significance … while Blacks are dependably Democratic, Whites split between the parties. Marital Status, Parental Status and Age are the weakest of the significant predictors … but, keep in mind that they are still statistically significant … insignificant variables didn’t even make the list. Of course, each individual is a composite of the 12 characteristics … some of which may lead them to lean left or lean right. So Economist and YouGov built an interactive tool that predicts a person’s political party preference based on their combination of characteristic. Plug in your characteristics and see if the model has you pegged right … or create profiles that you think are an interesting combination … or keep hitting the ‘randomize’ button to see the results for different profiles. Trust me, it’s a fun exercise… and, based on my trials, seems spot on. Thanks to SMH for feeding the lead. This entry was posted on November 13, 2018 at 6:59 am and is filed under 2018 Midterm Elections, Demograhics, Identity politics, Polls & Surveys. You can follow any responses to this entry through the RSS 2.0 feed. You can leave a response, or trackback from your own site.